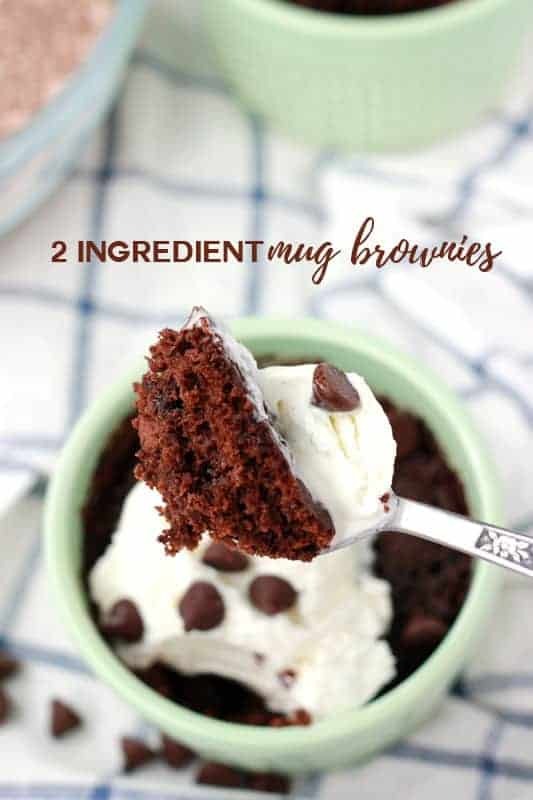 Satisfy that sweet tooth with these decadent 2 Ingredient Mug Brownies. 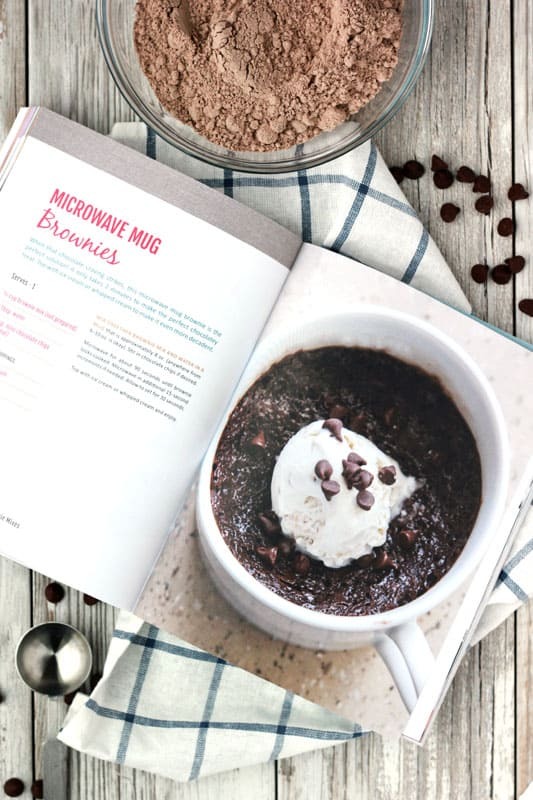 All you need is a large mug, brownie mix, and water! Can we talk brownies for a second? I have a deep love for those sweet chocolaty bars and they will always have a special place in my belly. I dig homemade but am definitely not one to snub my nose at a box mix. 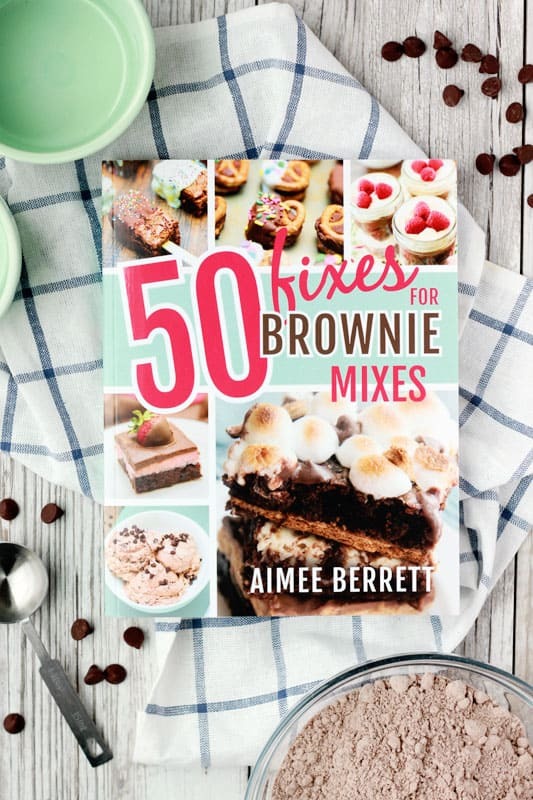 So when I saw this cleverly titled book 50 Fixes for Brownie Mixes, from my friend Aimee at Like Mother Like Daughter, I knew I needed to add it to my collection. The first recipe I knew I needed to make? I was pleasantly surprised by the wide variety of recipes included. There is everything from brownie pancakes, brownie ice cream, brownie milk shakes, and MUG BROWNIES. Basically what I’m saying is that you need to head into Costco or some other bulk warehouse and buy a bunch of brownie mixes so you can be prepared to make at least a dozen of these treats. Since the mug brownies took less than 2 ingredients and 90 seconds I knew they it was THE recipe for me. After pulling literally every single thing out of my pantry searching for a boxed mix (which was in the back because nothing can be easy, right?) I was ready to get started! I measured 1/2 cup of the dry mix in a ramekin (I know, I know… Not a mug. But they are so cute and I couldn’t help myself) with 3 tablespoons of water. After a 90 second ride on the microwave merry-go-round they were ready to be devoured! Hard to believe you can have a dessert ready in under five minutes, am I right? We topped ours with a little ice cream and chocolate syrup. We agreed that it gets two thumbs up. It did turn out a little more cake like but that works for me since I prefer my brownies less fudge textured. NOTE BEFORE YOU START: This is a mug recipe that only uses two ingredients. It won’t have the same oven baked taste that the classic recipe you know and love has. HOWEVER, they are still amazing and perfect for a quick treat! Like this recipe? 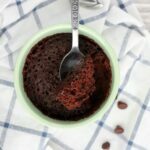 You will love my Nutella Mug Cake, Brownie Cookies, and The BEST Brownie Recipe! Combine the brownie mix and water in a mug. Mix to combine. 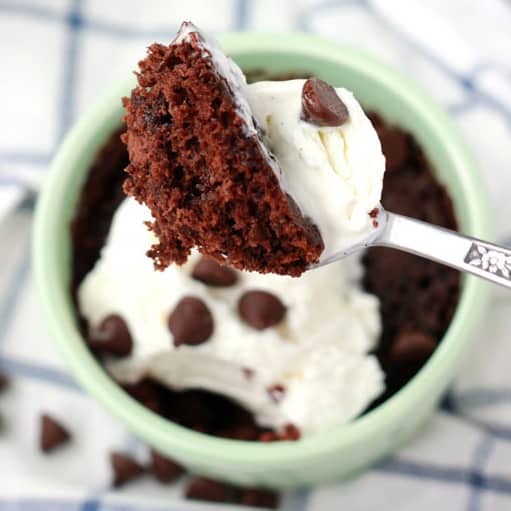 Top with whipped cream, ice cream, or chocolate chips. It is really great to know these recipes. I like making some simple cakes and this one should be one of my target. My kids also love cakes with chocolate. Thanks for sharing! If you want to take the little cakes out for looks, use oven spray. Oh. My. GOODNESS!! Reeses chips sound like heaven! I cannot wait to give that a try! this was terrible very chewy and disgusting don’t use this recipe ever! I’m sorry this recipe wasn’t for you. We have made it several times and have always enjoyed the end result. I’d be happy to help you troubleshot what went wrong if you’d like. Just made this at work. I was nervous because of the negative review but with a few changes thought this was amazing! I added a tablespoon of mini chocolate chips right in to the batter. Skipped the ice cream but frosted the top with chocolate frosting. I also only microwaved it for one minute and it was perfect! On a side note, I think this could be chewy if you microwave it for too long. My bestie made one for the full 90 seconds and it wasn’t as good as mine. Maybe our microwave is a higher wattage? Thanks for the good and easy dessert! We liked these. However, I did add chocolate chips and microwave it a little less time. It is what it is. A two ingredient brownie. Not the best ever but good in a pinch. We will make this again. Tried it and it was so good! 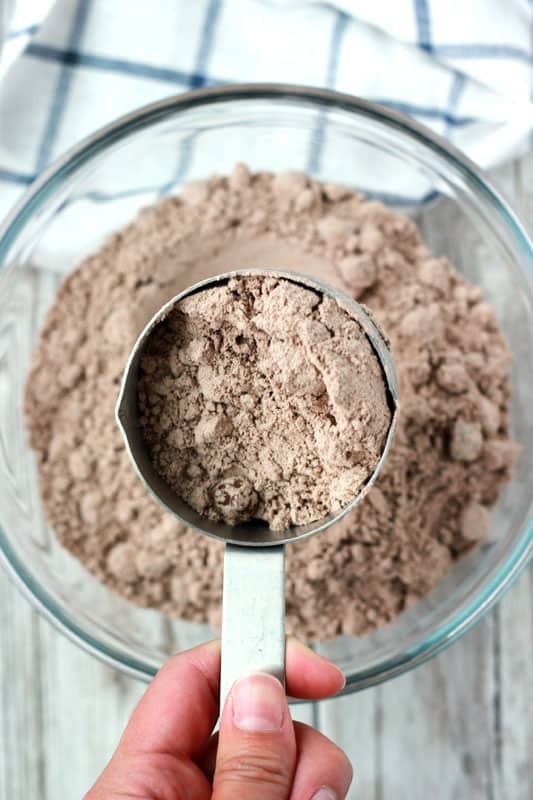 Do you have one for cake mixes? I will work on a cake mix version! We make it with just the two ingredients. No eggs needed. I do suggest watching it closely to make sure it doesn’t over cook and topping with chocolate chips, ice cream, or chocolate syrup. Super tasty and super easy! I love the addition of strawberries! We will have to give that a try sometime. Thanks for rating the recipe! You may have a higher power microwave. I know I do so I didn’t cook it as long, I did 1 min and then 15 seconds. Thanks for the tip TC! Added a dash of butter, went a little lighter on the water, and microwaved for 75. We like our brownies a little fudgy, and that did the trick. Thank you for guidance on a quick chocolate fix. The Costco Ghirardelli brownie mix was made for this recipe. Perfect results. Pushed a trader Joe’s dark chocolate pb cup into it after cooking for a delicious lava cake effect. YUM! I will have to try this version ASAP. It sounds amazing. I’m sorry you didn’t like it. Thank you for taking the time to comment and review the recipe. If you ever want to make it again let me know. I’ll help troubleshoot and find out what went wrong. 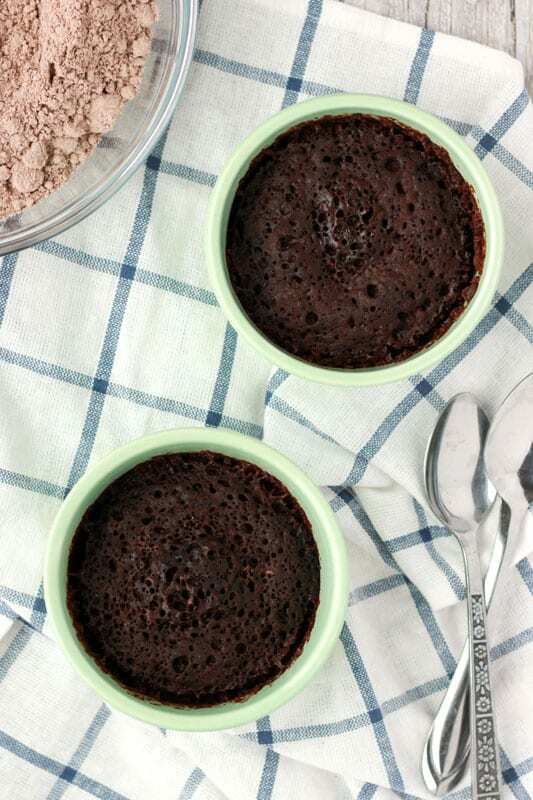 Ghirardelli’s Supreme brownie mix is our go-to for mug brownies. Fill a large mug slightly less than halfway with the mix, add 2T water, 2 tsp. of the included chocolate syrup and 1 heaping tsp. of Best Foods mayonnaise (it replaces the missing egg for texture and gives a wonderful flavor boost) in each mug. Stir well and microwave on high for 90-120 seconds, depending on your oven. Let cool several minutes. Mayo?? Kind of genius. I need to try this. Omg. I mixed half brownie mix and half red velvet cake mix 😍😍 amazing: My new favorite cheat meal! Um, you might be my new favorite person. Just tried this and it is heavenly! !